(Newser) – A Canadian inmate has lost his fight over powdered milk. The prisoner filed a grievance over the Correctional Service of Canada's policy of using the powdered dairy product rather than liquid milk, which was enacted in his facility in 2015, arguing that it violated his rights. William Johnson had claimed that he and other inmates cannot drink powdered milk (noting that the "majority of society dislikes and/or are unable to drink mixed powdered milk") and were thus "being denied their daily nutritional intake." Johnson stated that he previously used non-powdered milk in his cereal and was now prevented from consuming cereal as well. But a Federal Court judge last week dismissed Johnson's application for judicial review, finding that serving powdered milk to prisoners "does not constitute cruel and unusual punishment," as Justice Alan Diner wrote in his ruling. Oh waaah, drink water and have a baloney sandwich. Do these thugs think they're staying at the Hilton?? Suggestion: Don't break laws and you can have steak and lobster every night, crybabies. 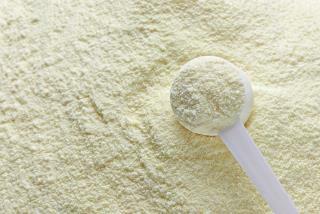 I grew up poor and having powdered milk back then was a luxury item for us. I'm sure he will go straight, stay out of jail and never have to drink powdered milk again.